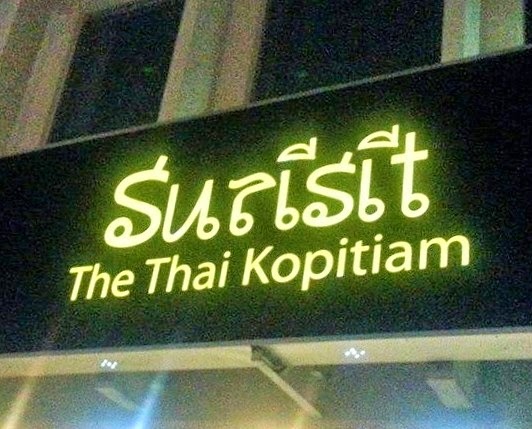 Hot on the heels of Surisit Taman Tun Dr Ismail (TTDI) comes Surisit in PJ, after its maiden success as the first Thai kopitiam of its kind to open in 2011. Owner Rivon Gill remains fired up in his enthusiastic quest to bring simple, home-style Thai food to Malaysians and Klang Valley residents love that. The new PJ outlet looks like your average 'tai chow' resto in most neighbourhoods; simply furnished with bright, flourescent lighting but air-conditioned that ensure dining in comfort. You can either savour a one-dish meal on your own or round up a gang of pals for a typical communal sharing experience. I'd go for the latter for a good sampling of different stuff from the menu. We like crowd-pleasing starters: Fried Prawn Cakes (RM14.90-6pcs, Thod Man Kung) and Catfish Mango Salad (RM18.90, Yam Pla Duk Foo Ma Mung) to whet the appetite. The little patties bring bursts of zingy hotness to the palate while the mildly tart salad has a well-balanced mixture of tantalising flavours and textures; cashewnuts, sliced onion and shredded mango thrown together with tiny dried shrimps in a wickedly appetising sour-spicy-salty dressing. The outlet's Thai-style Otak-otak comes in a coconut shell. Eye-catching and robustly spiced, it's like eating spoonfuls of delicate savoury mousse. Pork dishes are big with Surisit fans and this PJ outlet has several lined up including the famed Crispy Fried Pork with Shrimp Paste, Fried Kaffir Leaves and Chillies (RM19.90, Moo Thod Kapi). Aromatic and amply studded with bird's eye chilli, the Minced Pork with Thai Basil (RM16.90, Phat Krapao Moo Sap) should be enjoyed with plain white rice. It's unthinkable to eat Thai food without tom yum so a pot of Spicy Galangal-flavoured Seafood Soup with Coconut Cream (RM32.90, Tom Kah Thalay) was duly included. As expected, the broth packed a real punch - despite the innocent looking clear broth, the chilli heat ensured our tongues were scorched but heck, that's how a real tom yum should be. One of our fave Thai dishes has to be Claypot Glass Noodle Prawns (RM39.90, Kung Op Woon Sen) with coriander & garlic. Perhaps we had left the dish too long for photography - the glass noodles was a tad soggy for our liking but the sizeable prawns made up for that little grouse. Also the Thai-style deep fried squids with salted egg (RM19.90, Plamuk Phad Khikhem) passed muster. It was no worse than what one usually find at 'tai chow' stalls so no quibbles from us on this. Hmm...somehow the flavour dimension seems much more muted during our dinner. Even the Steamed Fish with Lime (RM42.90, Pla Nueng Prik Manau) overall garnered so-so feedback...either we were expecting stronger, more robust accents or the cook has gone far too easy on the requisite spices and flavourings. Still, all is not lost. We found some comfort in the Stir-fried Beef with Chilies and Thai Basil Leaves (RM18.90, Neua Phat Bai Grapao) - a scrumptiously punchy serving that made no bones about rolling with the hot & meaty nuances. The Prawns Fried with Long Beans and Thai Shrimp Paste (RM17.90, Thaw Fahgam Phat Khapi Kung) played its supporting role adequately. It wasn't a showstopper but just aptly dependable of fulfilling our green needs. Watching Chef Yenni Law showing off her art of flambé for Crêpe Suzette at the launch of her new Meatology book made me realised that table-side showmanship is so lacking in most modern restos today. The owner of Boathouse Restaurant (soon to be renamed Meatology after her tome) at Taman Tun Dr Ismail (TTDI) is one of the few chefs I know that cherishes this skillful technique. It's something not to be scoffed at or taken lightly as one wrong move can jolly well leave the chef or waiter who's handling the flambé job with singed eyebrows or nasty burns at worst. Essentially, Meatology is another milestone in Chef Yenni Law's culinary passage, detailing her initiation into the food world as a child helping out Mom in the kitchen and her eye-opening stint in Europe to taking up hotel management and becoming the chef and co-owner of Boathouse. It took her 1.5 years to complete the book; a project that brings her collection of do-able recipes (she had over 500 actually but everything was in bits and pieces) into print. Law confessed that she finds running a resto is tougher than doing the book as the former involved human relationships with staff, customers, suppliers, etc. She divulged that the simplest recipe in Meatology has to be the Braised Black Mussels with Spicy Tomato Concasse. It was also one of the dishes we sampled during her book launch and everyone had nothing but praises for it. The mussels were tender and perked up with a bracingly zingy chunky tomato concasse that enticed some of us to lick our plates clean. Law also admitted that she's rather old-school, resisting the idea of pictorial menus as she was formally trained in the rudiments of fine-dining. However, she's seriously considering it for her resto revamp into Meatology, a surefire attempt to please her customers. Glasses of chilled Mixed Fruit Punch helped to stave off the afternoon heat the minute we arrived at the launch. We found charming bottles of flavoured olive oil on the table - meant as takeaways from the event, with little goodie bags provided for us to cart them home. Our rumbling tummies were soon silenced with the arrival of a fresh, green salad - a simple but delicious combination of Beef Porsciutto with Rocket & Apple. A little vinaigrette was all that's needed to pull the whole ensemble together. Just as we were wondering how anyone could possibly deal with three mains at one go, warm plates decked with sampling portions of Grilled Lamb Cutlets with Aubergine Gremolata, Smoked Duck with Risotto & Ceps and Baked Roulade of Chicken Breast with Brown Mustard Cream appeared. 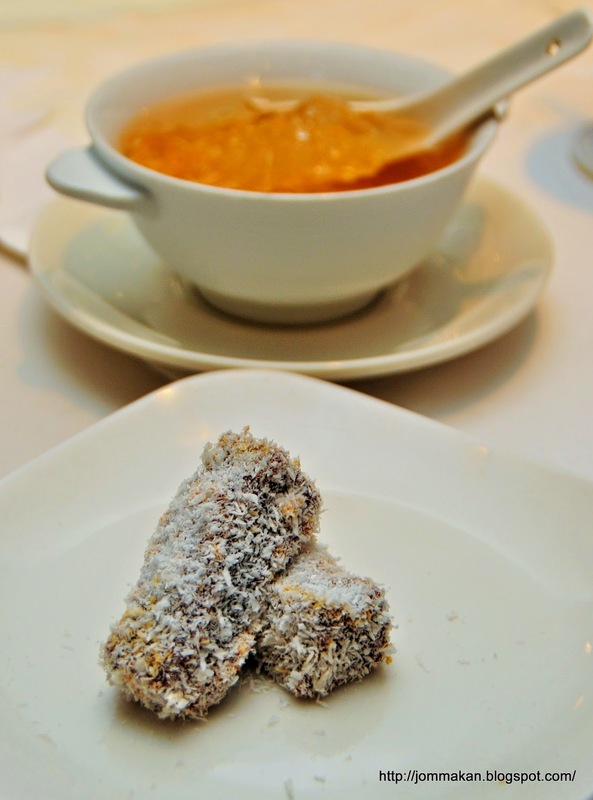 Murmurs of appreciation were heard as we tucked into the delicate but ample servings. The lamb cutlets were nicely pink in the centre, with a notable crust of panko (Japanese breadcrumbs), cheese, parsley and butter giving it a lightly crisp outer layer. Its deliciousness was closely rivalled by the delectably creamy risotto, suffused with subtle earthiness of ceps and the smoked duck's faintly smoky brininess. Despite us not being partial to chicken breast, the roulade left us happily satisfied and replete thanks to its moist juiciness enlivened by some mellow zesty mustard cream. Interest piqued again with the arrival of dessert - Poached Pear with Cream Cheese & Smoked Turkey Breast Stuffing. Never mind if the fruit was a little undercooked, our attention was drawn to the unusual filling of savoury cream cheese and bits of smoked turkey that punctuated the attendant cinnamon-scented syrup. Having looked through the book, most of the recipes seem okay for home cooks to replicate. There are detailed explanations with photos to guide us through the different preparations so if you want to try your hand at cooking Western-style dishes for your family, Chef Yenni Law's Meatology is the 'go-to' cookbook. Priced at RM39.90 per copy, you can buy Meatology at MPH and major bookstores. For information on the book, call Ms Lilian Ng, 03-7960 7334 x 119. Boathouse Restaurant is located at 16, Lorong Rahim Kajai 14, Taman Tun Dr Ismail, KL. Tel: 03-7727 4426. PJ residents recently welcome the return of Toh Yuen - the city's bastion of Chinese dining at the Hilton Petaling Jaya after a recent bout of rejuvenation in December last year. The breezy new look is much brighter and sleeker compared to the restaurant's previous broodier Chinoiserie concept. Pale gold, cream and lucite green hues with ebony black metal and rich dark wood trimmings beckon within the interior, leaving diners feeling completely at home. Besides getting a first-hand look at the resto's new ID, we were feted to samplings from the 2015 CNY set menus. Dinner commenced on a vivacious note with a serving of customary yee sang (raw fish salad). Priced from RM78++ for a regular portion, ours was Salmon & Pear Yee Sang. We really like the plump, juicy pomelo sacs and pear strips that punctuated the colourful refreshing salad with bursts of fruity sweetness. The pace warmed up further with Braised Fatt Choi Soup with Crab Meat - a velvety smooth broth strewn with fine threads of black seamoss, surimi crabstick, ethereal wisps of beaten egg and chunks of real crab meat. Nourishing and soulfully palate-pleasing. Wading into the celebratory line-up is Steamed Fish in Onion Oil & Light Soy Sauce - a safe surefire bet that's bound to float most 'boats' for its auspicious symbolism for excess abundance. Naturally no Chinese New Year feast is complete without chicken especially the poached version. Chinese Executive Chef Sam Lu decided to stick with tradition by proffering his take of Cantonese-style Simmered Chicken in Sand Ginger (Kaempferia galanga) Sauce. This is such a classic well-loved dish that it's hard to fault. Juicy with just enough resistance in the muscly meat, the succulent chook is best enjoyed with the house minced ginger & scallion dip. Little wolfberries (kei chi) and Chinese herbs bestowed their distinct nuances to the platter of Tiger Prawns, rendering enticing sweetness to the springy crustaceans. The delicate aroma and overtone of Chinese wine was also discernible in the clear, sweet jus pooled in the dish. Equally faultless was the creation of Braised Fish Paste stuffed with Dried Oyster, Top Shell and Mushroom in Abalone Sauce. Slathered in glossy, unctuous sauce, the different components not only herald fortuitous meanings for diners but also delight the palate with sublime deliciousness. Interestingly, the chef opted to serve Crispy Fried Flat Rice Noodles with Seafood in place of the usual waxed meat rice, befitting Toh Yuen's pork-free status. We were piqued by the heap of chewy fried kuay teow crackers which gave the dish extra chewiness. Save for the flood of gloopy sauce, the serving was quite agreeable. 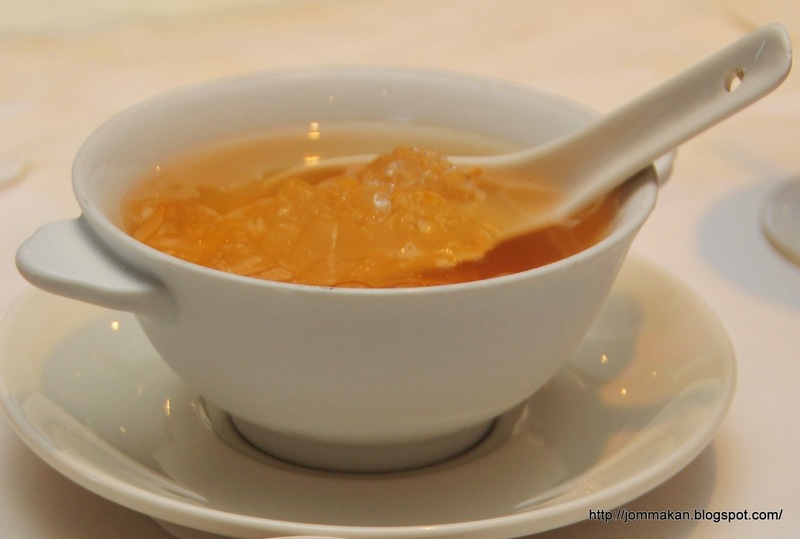 Lemongrass Jelly coupled with Steamed Nin Koh brought sweet closure to our preview. While we lapped up the citrusy jelly in syrup, the dry dessicated coconut covered glutinous rice cake didn't fare so well. Some freshly grated coconut flesh would have boost the sweet treat nicely. Toh Yuen's sumptuous Fatt Choy set meals are priced from RM1,288++ onwards for tables of 10 persons. For reservations, call Toh Yuen, tel: o3 7955 9122 extn. 4073. The restaurant is located Hilton Petaling Jaya, Jalan Barat, Petaling Jaya, Selangor. I'm in the mood for love...are you? With St Valentine's Day mere days away, now is the time to start panicking if you haven't made any reservations to wine and dine the love of your life! After sneaking samplings of the seductive San Valentino set menu at La Risata, I'd suggest you make haste and book a table asap. 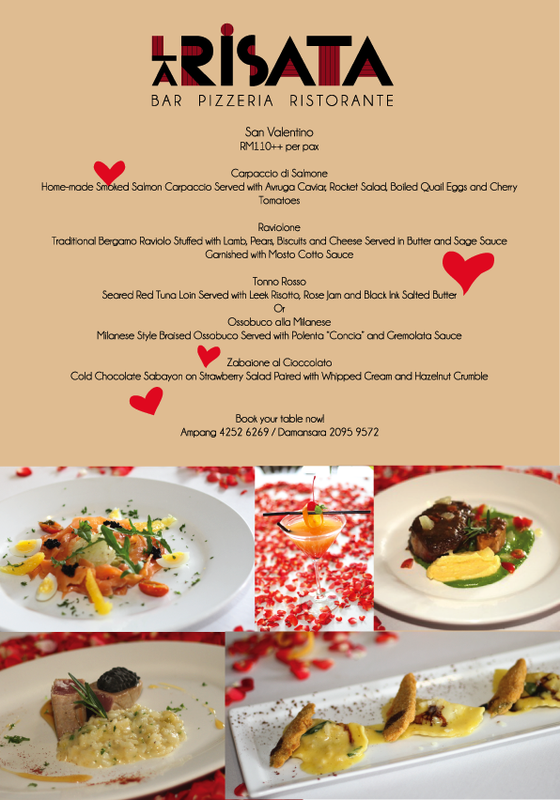 Priced at RM110++ per person, the lovely multi-course meal is available at both the Ampang and Damansara outlets. To set your pulse racing and palate aptly primed, a sublime amuse bouche of Chilled Gazpacho with Cumin & Capers will be served. The bright vermillion hue of the tomato conconction captures the red-hot passion of this lovey-dovey celebration perfectly. It's never too early to fish for compliments on your tasteful celebration venue choice as you tuck into the pretty as a picture appetiser of Smoked Salmon Carpaccio with Avruga Caviar, Rocket Salad, Boiled Quail Egg and Cherry Tomatoes. Light on the palate, the delicately rich quail egg and smoky fish slices dotted with tiny clusters of avruga caviar are balanced by the peppery zestiness of the rocket leaves and herbaceous accent of sliced fennel. Like your whispers of sweet nothings, the subsequent course of Traditional Bergamo Raviolo stuffed with Lamb, Pears, Biscuits & Cheese in Butter & Sage Sauce Garnished with Mosto Cotto Sauce should leave you waxing lyrical over its exquisite deliciousness. These dainty lil' parcels pack such voluptuous flavours that just one bite will leave you wanting more. The dark mosto cotto sauce is a chocolate reduction so the deep-seated nuance lends extra allure to the dish. For mains, the chef plans to proffer a choice of Seared Red Tuna Loin with Leek Risotto, Rose Jam & Squid Ink Salted Butter or Milanese Style Braised Osso Bucco with Polenta and Gremolata Sauce. Both are equally sumptuous so you'd have to follow your heart or palate. The tuna is deftly prepared with a blush-pink centre and an outer seared rim, leaving it buttery tender. A match made in culinary heaven on a bed of creamy, nutty risotto, fragrant rose jam and a squiggle of bewitchingly dark squid ink-tinted butter. The osso bucco ('bone with a hole' in Italian) is a Northern Italian speciality of cross-cut braised veal shank (revealing the marrow within the bone). Staying true to tradition albeit with a modern take on its presentation, the delectable meat is enlivened with gremolata (chopped herb condiment using parsley or coriander blended with garlic and lemon zest) and polenta (cornmeal). The sweet treat of Cold Chocolate Sabayon on Strawberry Salad with Hazelnut Crumble & Whipped Cream is bound to set hearts a-flutter. Admittedly the classic trinity of strawberries, chocolate and nuts is a real tease; coyly sinful without segueing into utter decadence. La Risata is not only for the lovelorn as its relaxed, inviting ambience also attracts a fair share of the professional and family crowd. Timeless classics rule the roost so if you're craving for some good hearty pizzas or comforting pasta dishes, take a seat and eat to your heart's content. Groups of two or more would do well to start with the house Antipasti Misti (RM42) comprising buttery grilled mushrooms, crisp deep-fried calamari rings, slivers of beef carpaccio with cheese and garlic crostini with chicken liver pâté. We find the last most addictive especially when eaten with the sliced garlic, to counter the dense richness of the velvety pâté. Pizza fans are spoiled for choice as there's 20 different variants listed! Naturally, the runaway crowd fave is Pizza Fruittì Di Mare (RM31++). Laden with succulent squid, mussels and prawns and accented with garlic, tomato and mozzarella on a thin and crunchy crust, it is possibly one of the better (if not the best) seafood pizzas in town. Like Giorgio Armani's designs which advocate 'less is more', the Pizza Pera E Gorgonzola (RM30++) may look a tad plain but bite into a slice and you'd discover its true 'beauty'. The sweet-salty-savoury-peppery overtones rendered by the pear shavings, fresh rocket, gorgonzola, mozzarella and walnuts on the pizza are simply 'to die for'. If you want something more distinctive, try the Pizza D'Anatra (RM36++) which marries smoked duck, rocket leaves and anchovies with caramelised onion and mozzarella. The results are surprisingly agreeable despite having so many strongly flavoured ingredients vying for attention. Meat & potato fans would enjoy Agnello Alla Griglia (RM56++) - grilled chilled Australian lamb tenderloin with fennel & black pepper crust on a bed of mashed chickpea and vegetable caponata. Again the doneness is perfectly executed, leaving the loin centre with a healthy pink. Finished with a red wine reduction and boosted by the scrumptious 'side kicks', this speciality should leave you happily replete. Those who prefer fish, we recommend the Pesce Alle Melanzañe Piccante (RM38++) - fried barramundi with sauteed eggplant, anchovy, garlic, pine nuts and chilli flakes, and julienned vegetables. You'd be hard pressed to find fault with the ensemble's delicate appearance and subtle layering of textures and taste. It is commendable that the vegetables are handled with a light hand, to retain their gorgeous colours and textures. 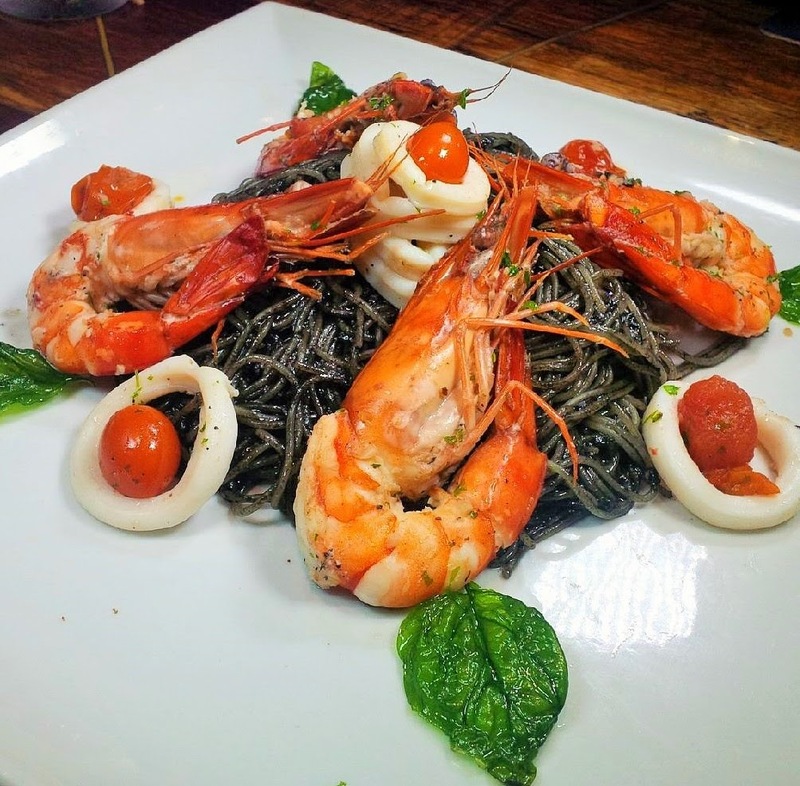 Pasta choices also abound but trust me, once you go black with Capellini Al Nero Con Fruittì Di Mare (RM35++), there's no turning back. The perfectly al dente angel hair pasta dressed in squid ink come adorned with juicy cherry tomatoes, whole springy prawns and squid rings. I have a penchant for wicked Italian dessert and top of the list is Zucotto (RM18++). Now this pix doesn't do this liquer-spiked dome cake justice. Chocoholics would go weak at the knees at its chocolatey centre surrounded by vanilla cream studded with bits of almond, hazelnuts and more chocolate! Savouring the Sicilian Bombe (RM38++ ample for two) brought back memories of my first taste of a classic dessert known as bombe Alaska. Both works on the same premise to impress - the outer meringue layer is doused with alcohol (usually brandy) then set alight to scorch the surface. Dig into the liquer-laced sponge and you'd find chilled lemon cream...talk about fire & ice. Italians are crazy about Cannoli (RM16++) - Sicilian fried pastry shell filled with sweet ricotta cream then dipped in chocolate and pistachio bits. Find out what's the appeal for yourself here...it's an irresistible treat with lots of crunch and naughty temptation. Personally I've never been a fan of the Christmas panettone as I find it hard and dry. But La Risata's Panettone Bread & Butter Pudding (RM16++) has changed my view drastically as it has never crossed my mind that the bread can be transformed into such a wonderful dessert. Studded with plump raisins and choccy bits, the spongy pudding is enlivened further with butterscotch and vanilla ice cream. Yums.